Posted on June 22, 2018 . by Patrick Johnstone. Leave a comment. Our second Council meeting last this week was held on Tuesday, with Special Public Hearings to hear from the public on two Bylaw changes related to the Queens Park Heritage Conservation Area, and our ongoing efforts to improve the policy. The City committed, when implementing a Heritage Conservation Area (HCA) to also add some incentives to provide better positive benefits for those who investing heritage conservation. Although ideally we would have done this at the same time as introducing the HCA, the statutory limits to the Heritage Protection Period and intensive community conversation and policy work that went into getting the HCA right and rolled out on time simple left us with limited resources to do the incentives work. This work has now been done, and a first phase of incentives are ready to be implemented. We have had quite a bit of conversation about this, and I talked about some of it in my May 14 Council Report. Through these conversations, the proposed incentives were pared down to three groups: those to be implemented immediately, those that need more policy work, which should be implemented within the next year, and those that either are longer-term or more City-wide, and will take yet more work to bring about. This Zoning Amendment is to support a couple of those “immediate” incentives, those that require an amendment to the Zoning Bylaw. In short, we will permit a slightly larger house on protected properties than is generally permitted in single family residential zones (FSR 0.7 instead of a usual 0.5), and will allow homeowners to “shift” some of this density (if they don’t want to improve their principle residence) over to a laneway of carriage house, as long as that secondary building does not exceed 958 square feet. There is a bit of nuance in this. First off, the maximum allowable site coverage (that is the amount of a lot covered by buildings as opposed to lawn or garden) is not going to go up, so this should not result in a big change in the amount of green space. There is also some detail in how we count attic and basement space towards FSR that may be too complex for this quick summary. This incentive structure should provide the most flexibility to homeowners to maximize their living space, and add secondary rental suites. We had a bit of correspondence on this item, about a dozen written submissions, almost all in support, and we had about a dozen people come to speak at the public hearing, again generally in favour. Some concerns were raised in regards to loss of green space (which I think will still be protected by the limit on site coverage), and some delegates are still irritated by the concept of the HCA, but I go the sense that the public understand and appreciate the incentives offered so far. Council gave this Zoning Bylaw Amendment third reading and adoption: it is now the law of the land. When the HCA was put in, all residential properties in the Queens Park were put into one of three categories: Advanced (meaning they are fully protected, due to age and inferred heritage value), Limited (meaning they are not protected against demolition, as they are not old enough to constitute heritage), and Special Limited, which was somewhere in the middle, partly because their heritage value was uncertain, and partly because the nature of the residence may have created an unreasonable burden to the homeowner if they were fully protected. At the time, it was acknowledged that further analysis of these 85 “in the middle” properties would be required before eventually re-classifying them to one or the other category. As moving properties between categories requires an Official Community Plan Amendment, staff recognized that doing these by groups will be easier than doing each individually. They created a phased screening approach to this, and the first phase is currently complete. As a result, 35 properties were recommended to be moved from Special Limited to Limited, essentially reducing the protection on the properties. This first screening was done by the City with the help of consultants. The screening was a desktop exercise where the age and heritage value of the property was evaluated at a very basic level, as was the potential for the homeowner to achieve their zoning entitlement while still protecting the intact residence. Of the 85 Special Limited properties, 35 were found to have a combination of low heritage value and severe infringement of zoning entitlements such that removing them from protection made sense. Each of these homeowners was contacted to let them know that staff would be recommending removing their protection. They were given an opportunity to “opt in” to Advanced protection, if they wished to avail themselves of incentives (discussed above). As a complication, one of the 35 property owners being exempted requested (too late to get into this OCP Amendment Bylaw) that their protection be increased instead of reduced, so Council tacked on a motion asking staff to fast-track their individual shift from Limited to Advanced protection, after this omnibus shift of properties to Limited. Again, we received about 20 pieces of correspondence on the OCP Amendment, almost all in favour. We also had about a dozen delegates, mostly in favour. Council moved to give this OCP Amendment Third Reading and Adoption. The entire HCA process has been a challenge. The call of some level of protection for the Queens Park neighbourhood led to the previous Council appointing a community working group, who put together some recommendations for this Council. The temporary Heritage Protection Period that was necessary to prevent demolitions put a tight deadline on the development of an HCA, and a lot of policy work and consultation with the community resulted in a suite of measures that will bring reasonable protection to the heritage assets of Queens Park, but will still allow the neighbourhood to grow and evolve, so it can still be a vibrant neighbourhood with a variety of housing. There is more work to go yet, but I am happy with the approach we have taken. Many thanks need to go to the staff for putting this challenging program together, and to the community for continuing to be engaged in this program and providing valuable feedback that is making the policy stronger. Posted on February 6, 2018 . by Patrick Johnstone. Leave a comment. Another council meeting, and another delegation from residents concerned that the Heritage Conservation Area in Queens Park has unleashed economic disaster on Queens Park. I have not written up my notes from yesterday’s meeting yet, but I first want to talk about a subject that came up in the Open Delegations, and a meeting tomorrow about it. I feel the need to explain that I am a champion for people delegating to keep Council informed about their concerns. I want Open Delegations to be an inviting and comfortable place, and am cognizant that there is a power dynamic here. My directly challenging delegates could be seen as – can genuinely feel like – I am “punching down” from a position of authority. For that reason, I am very sensitive in that setting not to engage in a debate about the facts delegates present. Too often that comes across as challenging their right to be heard. If I counter their facts in that setting, it can be construed as dismissing or doubting their opinions, and ultimately, not being respectful. So I often takes notes and thank them, and save my questions or comments to delegates for points of clarity, to reinforce things I agree with, or to initiate discussions about how Council or Staff can operationalize around their concerns (see other delegations that day). Regular readers (Hi Mom!) 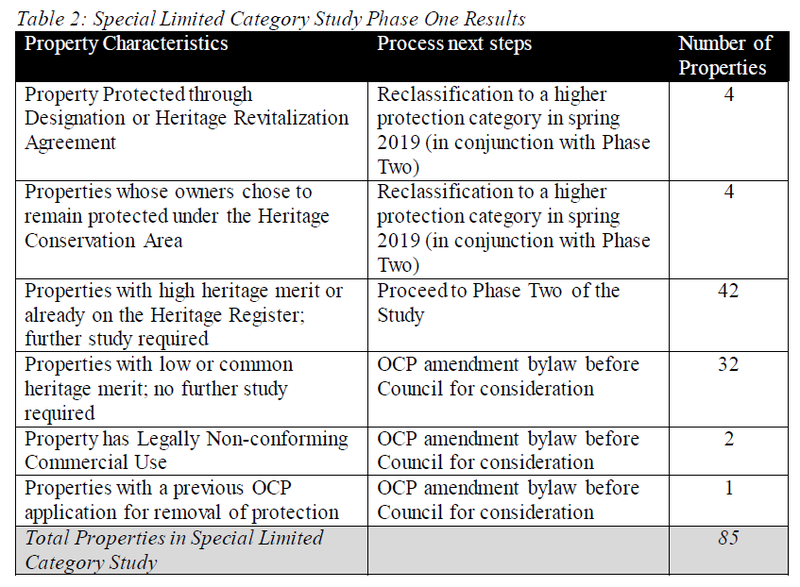 would also note I have an itch to correct the record, so I am writing this to correct one common theme I heard, with all due respect to the strongly felt convictions of the delegates: There is simply no evidence that the Heritage Conservation Area has impacted the values of homes in Queens Park. At least, not yet. When the annual BC Assessments came out recently, many people noted that housing values have not increased as much as condo values this year. This is a trend across New West and the region, and may be attributed to condos starting to “catch up” to the last few years of significant increases in the single family home sector. It also appears that many single family homes remained stagnant or even decreased slightly in value this year. This is the case for most homes in Queens Park. 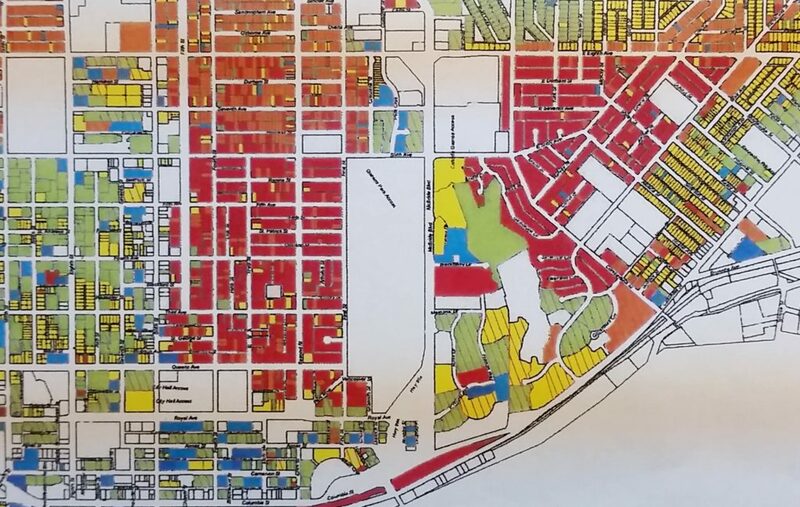 This (horribly scanned, apologies) image shows every residential property in New West based on how their assessment changed in 2018. GREEN went up more than 15%; YELLOW was an average increase between 5 and 15%; ORANGE had an increase under 5%; RED a decrease. A careful analysis of individual homes throughout Queens Park, however, show that there is no bulk difference between homes that fell under higher levels of protection (those built before 1940) and those with limited or no protection. With only a few exceptions, the variations within the neighbourhood seems more related to the block the house is on than anything else. Same crappy scan, same colour codes. Note single-family parts of upper Glenbrook and Upper Sapperton areas had similar declines as Queens Park. Perhaps more tellingly, homes in the Glenbrook and Upper Sapperton neighboruhoods had similar stagnant or slight reductions in value. These houses are not (for the most part) older homes, have no Heritage Conservation Area, and only resemble Queens Park in that they are fairly high-value homes on relatively large lots. If the HCA caused the stagnation in Queens Park, we will need another, yet completely separate, explanation for this remarkably similar stagnation on the other side of McBride. Declines were generally 1-5% in both areas. Note, the 2018 assessment were completed only a month or so after the rules around the new HCA were developed. 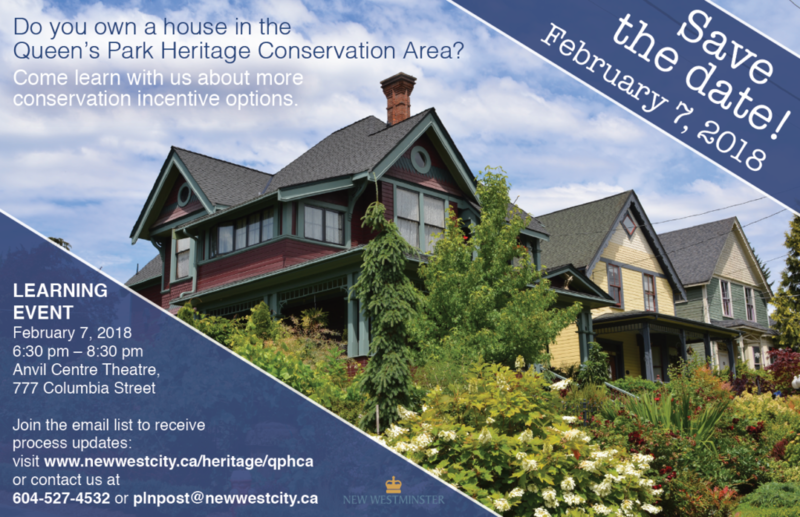 Although there was a 6-month temporary conservation measure and significant community conversation about the potential HCA, it is fair to say that the implementation of the HCA may not have had an impact on the Assessors work, but the market by that time definitely had a strong wind that something was going to happen, what with the Lawn Sign war and all. What I m saying here is that we don’t yet know the short- or long-term impact on housing values related to the HCA. We have evidence from other jurisdictions that there may be a small short-term decline, followed by accelerated increases, and that the long-term trend is towards higher values. However, give me a trend you want to see, and I can probably find a Heritage Area somewhere that matches it. There are hundreds of districts like this around North America, and there are too many confounding variables to say with certainty what the impact will be. The best bet, based on an accumulation of data, is that the impact (positive or negative) will be small. I do want to emphasize that increasing property values was not a goal of the HCA; protecting the heritage of a unique neighbourhood was. That said, Council recognized that the heritage goals will not be met simply by banning demolitions of heritage homes, but we need a suite of measures to encourage residents to preserve the neighbourhood. Preventing demolitions was priority #1 simply because of the timelines imposed by the Local Government Act, setting up regulations around renovations, repairs, and upkeep was also a high priority. The City recognizes the need to provide more “carrots” to give people reason to invest in their heritage properties. So we are working through a process of determining what an appropriate set of incentives are that will make it more attractive for people to take advanced protection measures (like Designation), potentially help with specific cases where the broad brush of the HCA may make it difficult to fulfill their zoning entitlements, or where we can find opportunities to increase housing choice, affordability, or flexibility while protecting heritage assets. Posted on July 25, 2017 July 25, 2017 . by Patrick Johnstone. 1 Comment. “A Stairway to Nowhere”. Literally the second paragraph of the story undermines the headline, but Global never lets a good lede go to waste, reality be damned. The alleged “Stairway to Nowhere” is a fire exit, required by the building code because the ~100-year-old heritage buildings adjacent do not have internal staircases to facilitate fire egress in the event a fire or other emergency blocks the front entrance. The connections between the staircase and the building have not been completed yet, because the ~100-year-old heritage electrical connections to the ~100-year-old heritage buildings are going to be moved to make the Front Street Mews look and work better, and life will be better for everyone if the lines are moved before the fire escape connections are made. The fire escape needed to be built because the Parkade was removed. The ~100-year-old heritage building used to have gangways that connected to the Parkade to facilitate fire egress. Those were part of the “railings, lights, stairs, wheelguards, and other ‘jewellery’ [that were] past their service life and [fell] far short of modern safety codes” that I talk about in that blog post from 2015. Until the new connections are made, there is a lighter-duty and even more temporary fire escape on Columbia Street which is (arguably) as intrusive as this one. The owner of the ~100-year-old heritage building, naturally, has some say in how these connections are made, and is apparently quite satisfied with the stairway on Front Street. The cost of installing this stairway or otherwise providing alternate egress for the ~100-year-old heritage building is not an unexpected expense, but part of the (budgeted) $11 Million cost of the Parkade half-repair, Parkade half-removal, Front Street re-engineering and general gussying-up project that was approved by Council a couple of years ago. At last report, this project is still on budget, although its finish was delayed for a bunch of reasons that were reasonably unanticipated. There were some changes to the design over the couple of years since first proposed, not the least being that all of the electrical services were undergrounded, which is a significant improvement to the aesthetic of the Mews, and will make the pedestrian realm more friendly. All of this doesn’t mean I am happy with the staircase (**insert part where I say this is my opinion, not official position of the City, Council, or anyone else**). I was actually pretty (excuse me, Mom) pissed off when I first looked at this temporary solution for the fire escape and it was explained to me that “temporary” meant “for the foreseeable future”. 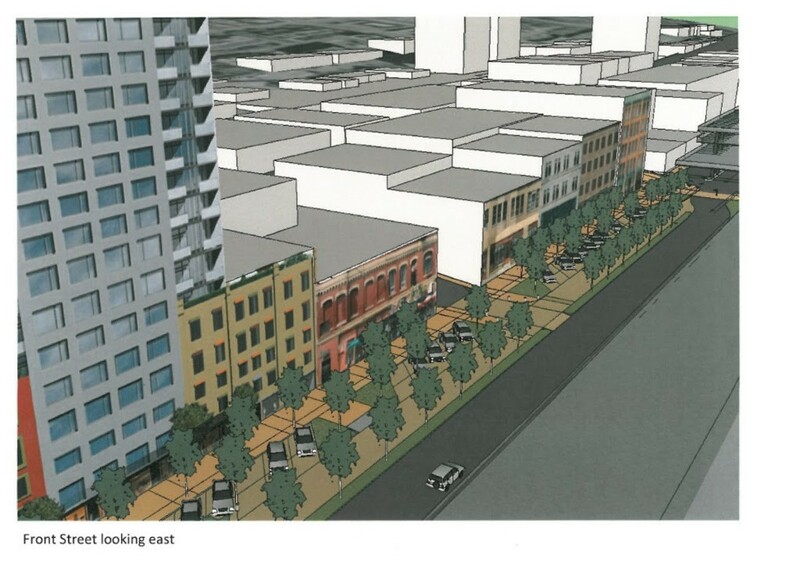 Looking back at the many renderings for the Front Street Mews used for public consultation over the years, the stairs were never depicted, and to me the structure is oversized, obtrusive, and at odds with what vision we are trying to create on the Mews. With our Open Space planning staff doing so much good work to make Front Street a comfortable, human-scaled, and functional space, this looks like something designed by (I’m sorry) an engineer. My first reaction was to think that a fire escape, by its very nature, would be used by a half-dozen people only once, if at all. 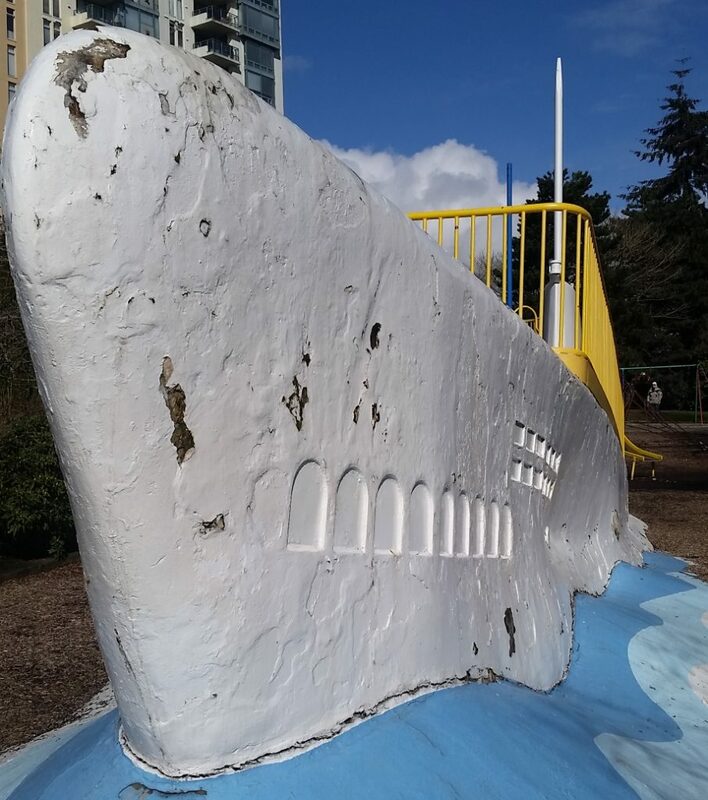 This structure looks like it was engineered to facilitate the boarding of troops onto naval vessels. However, I am told that modern fire access standards for commercial buildings expect that well-equipped firefighters will use the stairs, and carry large things up and down them with some significant urgency. The stairs are also expected to remain standing after a seismic event that no ~100-year-old heritage building was built to sustain. So it is bigger, stronger, and with a much more substantial foundation than the stairs going (for example) up to the back deck in my house. It is also a modular design that can be picked up and moved, as it was recognized at the time as a “temporary” structure, which can be utilized elsewhere if ever major renovations to the ~100-year-old heritage building make the stairway’s presence on Front Street no longer necessary. Put these factors together, and the design, fabrication and installation costs are more than my aforementioned deck stairs. Other options were explored by staff and the owner of the building. Maintaining access above Columbia Street was suboptimal, building an access on the McKenzie Street side simply didn’t work with the internal layout of the ~100-year-old heritage building. No-one was excited about the potential engineering challenges of hanging something that met modern standards off the side of a ~100-year-old heritage building. So in the end, they are ugly and look overbuilt, but represent the best of several bad options given the circumstances. I don’t like the way the stairway looks, but have no viable alternatives to offer. Nor, I note, do the armchair engineers or outrage-mongers at Global. Posted on January 24, 2017 . by Patrick Johnstone. Leave a comment. 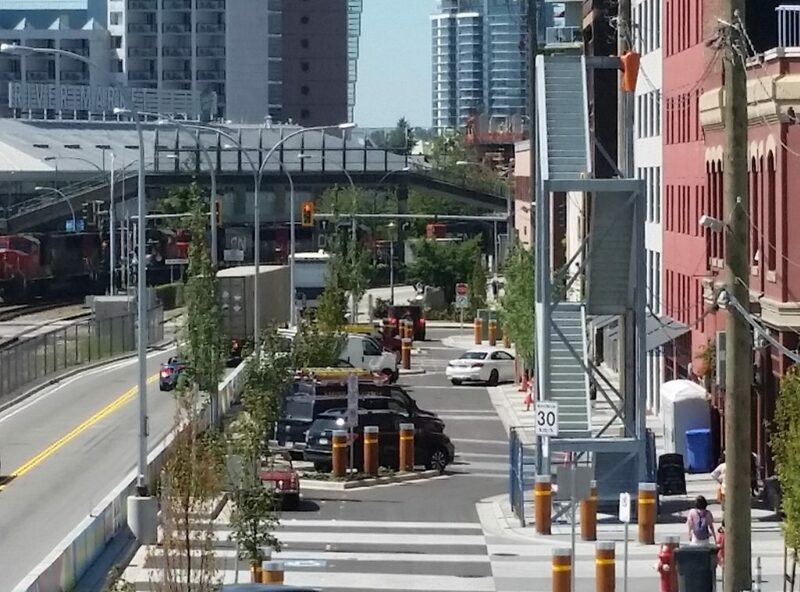 After several months of disruption, it is with little fanfare that the New Westminster Skytrain station was fully re-opened after renovation. 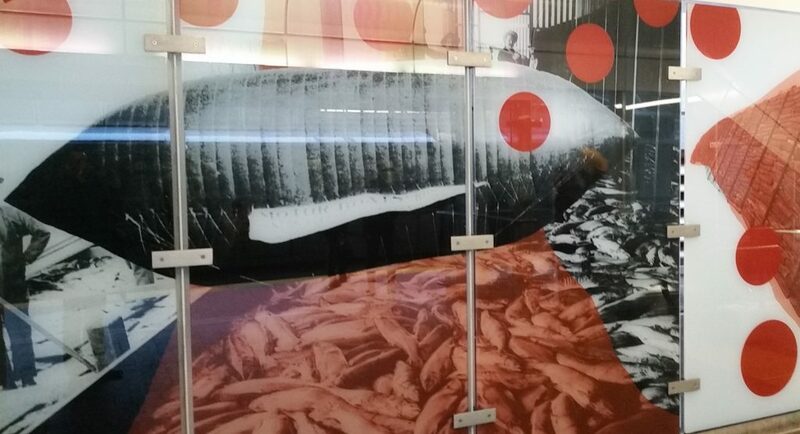 Immediately noticeable in the new station is the mural stretching up the staircase to the eastbound platform. 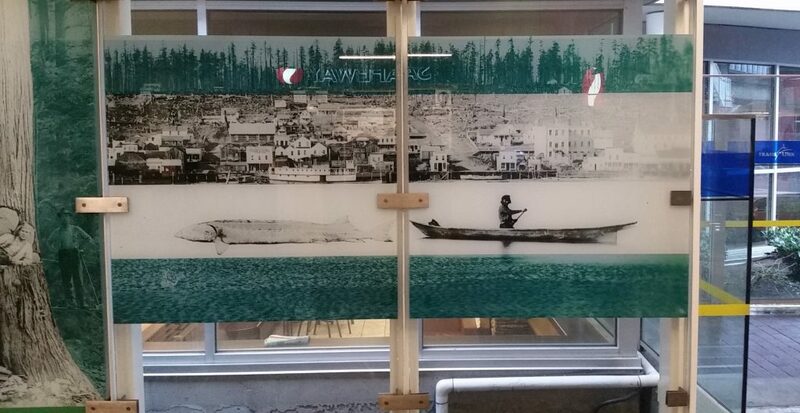 In a nice understated nod to local history, the glass mural is an amalgam of images from New Westminster history, some familiar, some not. 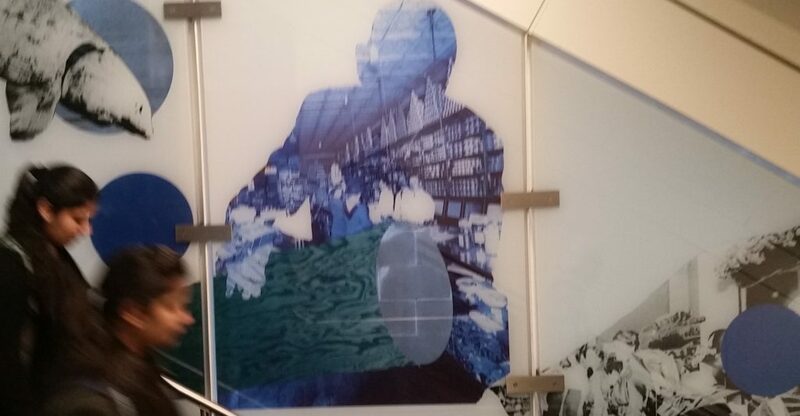 The photos were drawn form New West Archives and the Vancouver Public Library collection, and collaged with colour effects by artist Sean Alward. 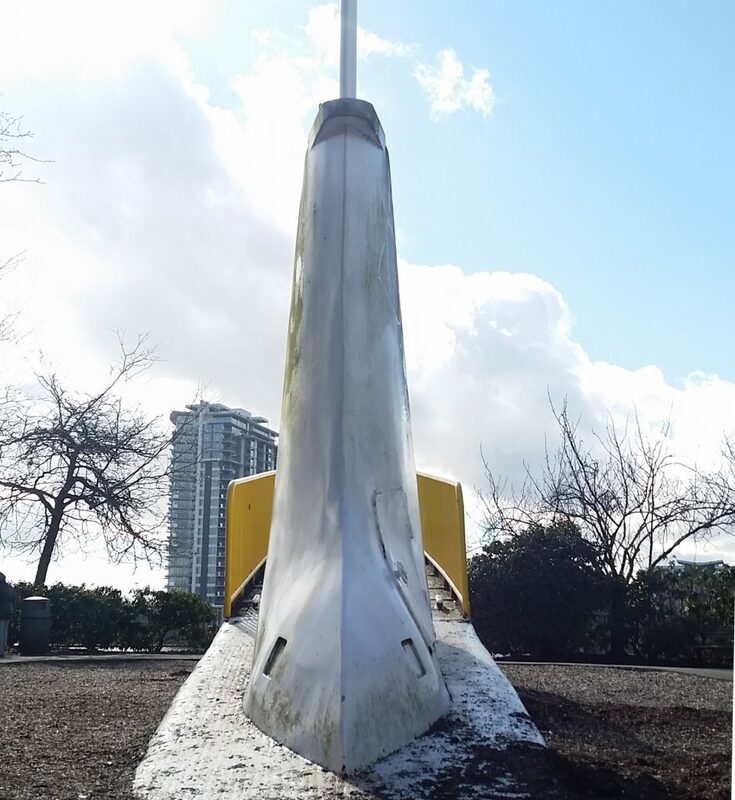 The overall effect down the staircase is to mimic the flow of the Fraser River itself, with various pictures of “nature” juxtaposed with “resources” that we have created from nature through a 150+ year history of New Westminster’s development. And the people are more shadows, impressions imposed on the background. A really nice piece. And what’s with the blimp?